Hot Cross Buns, the traditional, fruit studded rolls served on Good Friday and at many Easter celebrations, originated in England as early as the 1500’s. Recently, the bakery at the famous London department store, Harrod’s, featured two kinds of Hot Cross Buns: the traditional sweet rolls (theirs containing bits of fruit-cake mix and currants), and also savory ones dotted with Gruyere cheese and scallions. Both versions were delicious, of course. 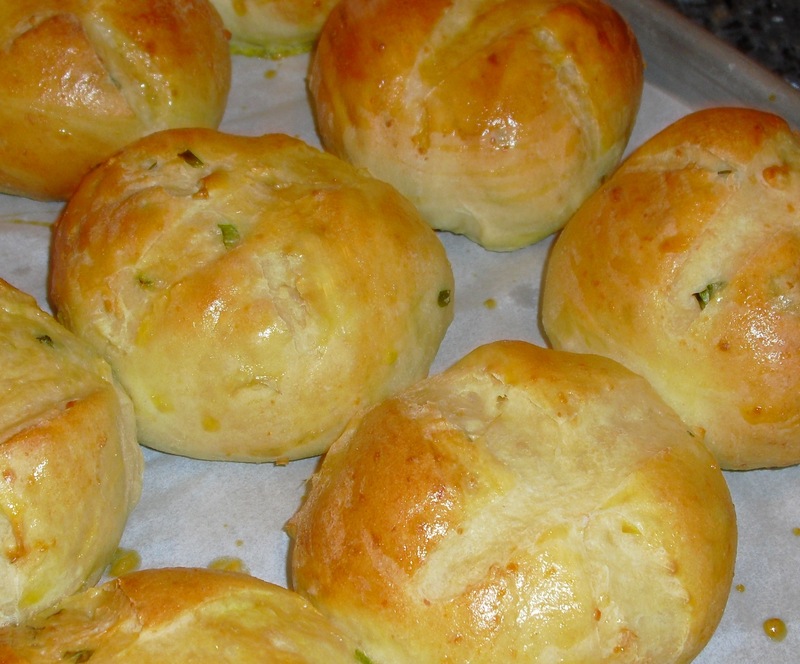 Since most of us can’t just pop over to Harrod’s to pick up a dozen or so, the following recipe is close enough that they can be at least called Almost Harrod’s Gruyere & Scallion Hot Cross Buns. In this version, the dough is made in the automatic bread machine to save time, and also to free up the cook for more important pursuits. Once finished, the dough is quickly formed into balls and allowed to rise. Just before baking, the rolls are slashed with a knife or bread razor and brushed with an egg mixture. These buns are easy, and hands-on time is very minimal. Not only can they be served for Easter dinner, they make great sandwich buns for the leftovers. Other times, pair them with soups, stews, and salads. Place all ingredients except cheese, scallions, and egg yolk, in the order given in the pan of the automatic bread machine. After 5 minutes of mixing, check to see that the mixture has formed a ball of soft dough. If the ball is too soft, add a little more flour; if the ball is too stiff, add a little more water and re-start. After the cycle has run for 30 minutes, add the cheese chunks and scallions. When the cycle has finished, transfer the dough to a lightly floured pastry cloth. Cut the dough into 12 pieces and form each of the pieces into a ball. Place each ball on a parchment-lined baking sheet. Cover loosely with a clean dish towel, and let rise until doubled in bulk. With a very sharp knife or bread razor, make a deep slash in the shape of a cross. Brush with the egg yolk mixture. Bake 15-20 minutes in a preheated 350° oven until golden.